I’ve been using the U.S. East Coast version of Navionics Mobile Charts for a couple of months now, and it’s getting rapidly better, as shown in my screen shots below. 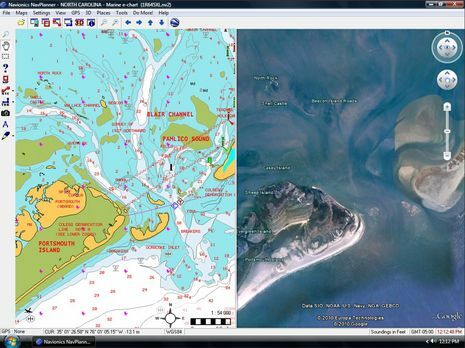 The charts themselves have always looked great, and zoomed/panned with reasonable speed, but recently Navionics has added the Safety Depth control (which nicely highlighted the bottom situation around the marina where the future Gizmo may now be hauled), not to mention simple A-B measurements, and a much improved search facility. Best of all, the problem of touch picking objects of interest was nicely solved. Now tapping anywhere near, say, that “1A” nav aid gets a list that includes it and everything else nearby. Marinas don’t have phone numbers, but buoys do have characteristics. Now I don’t have Navionics Mobile running with a GPS, and thus may be missing something, but I don’t think it does much more than a simple plotting right now. I also gather that the iNavX relationship I once wrote of didn’t actually happen, but that Navionics intends to add many charting features to this program. I’m sure those easy iTunes software updates will keep coming. Meanwhile iNavX is working with Fugawi whose new X-Traverse service makes it possible to share data — waypoints, routes, and certain charts — between iNavX on your iPhone and MacENC on your Mac (now also distributed by Maptech) or Fugawi Marine ENC on your PC. In fact the X-Traverse servers are capable of doing all sorts of data sharing that the iPhone is not friendly about (if app developers participate) and Fugawi is also making deals on cartography it can distribute via the same service, so far mostly topos but they do have some Canadian lakes and Swedish charts. 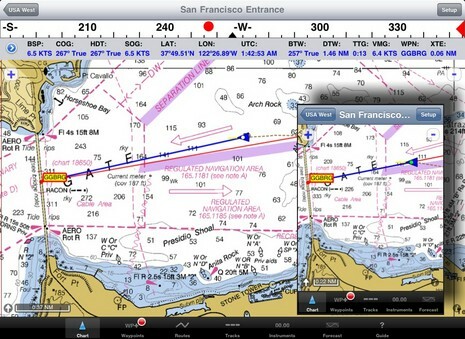 I think I can try iNavX and X-Traverse on my iTouch, and intend to, along with Navimatics (and thanks to the latter two for trying MadMariner’s new Panbo ad program). But really I should have an iPhone with its included GPS, which led me to trolling eBay this morning for used ones. Yike, even old 2G models with cracked glass faces are hot sellersl there! And I also need a Windows Mobile phone to check out the latest version of Active Captain Mobile as well as Memory Map’s new QuickCharts (just insert SD card and the program and charts are ready to go). Oh, and it will be interesting to watch the iPhone 3.0 and nuviPhone battle out turn-by-turn car nav. Yi! Next story Battery Bugs, new monitoring tech? ATT is going to be dumping iPhone 3Gs ahead of an expected Apple product refresh sometime this summer. You may be able to upgrade to a 3G for $199 after March 26th. Over at macsailing.net Rich has sweetened the pot by announcing that the upcoming version of iNavX will include GRIB file support. The new iPhone/iPod touch software announced on St Patrick’s day will supposedly enable the bluetooth radio in the second generation iPod touch. It is said to support A2DP (stereo headphones), peer to peer functionality, and other devices like medical equipment. This is where it gets interesting, since theoretically this could also include a bluetooth GPS reciever! Certainly we will have to wait and see on this though, as the released software will only be avaliable in June. Currently there are developer releases, but not all features are necessarily enabled. Very interesting detail I’d missed on the iPod Bluetooth front. It will be irritating to throw away the $50 Sony Bluetooth dongle I bought (damn Apple!) so I could use my Motorola Rzr headset (works well), but wonderful get the use of other Bluetooth devices like GPS. You….don’t have an iPhone? I’m shocked! 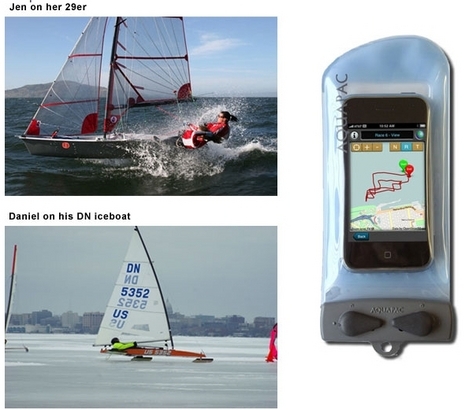 I was depending on your first hand, leading edge reviews on how this cell phone plays out in the nautical community. Apple should just give you one as I’m sure they will see a noticeable bump up in iPhone sales as a result. How is the 3G coverage up in Maine? Did you read the one review of Navimatic’s app on the iTunes app store? Ouch. 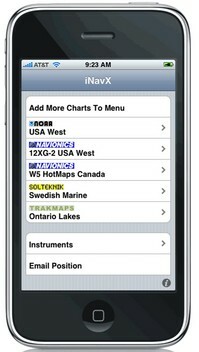 I’ve been using iNavX and and GPS MotionX (which Phillippe Kahn is heavily involved in, BTW) on my iPhone 3G and am very impressed w/both, particularly iNavX’s ability to download charts on the fly. Time for you to swap that Touch for the real deal. The iPhone is not really compatible with my current, and beloved, cell number (no local AT&T service available). But I did look at eBay iPhones (just to test nav software on) and, amazingly, almost bid on one from Hungary with a broken glass. The 2nd hand prices are nuts. But then I heard that Apple is going to enable my iPod Touch’s Bluetooth radio when the 3.0 software is released. That hurts a bit, given the $55 Sony Bluetooth dongle I bought to go with my Motorola Rzr stereo headset, but will hopefully mean that I can use Bluetooth GPS. The dongle works great, by the way, but only for audio. Maybe I should sell it on eBay now! You’re absolutely right, it isn’t fair to judge, it was more of a comment than anything else. I read ibsailn’s review, which was informative, although he still regards INavX as better for actual navigation. I’ll be happy to test any IPhone 3g software you come upon! Yup, it may be time to ‘Bay the dongle . . .
A really killer app that has got tons of great reviews is called windalert. Check it out. It is extremely user friendly and allows you to set up multiple profiles of weather stations from all over the world. You can view the wind on maps or in preconfigured lists. Alerts can be set for time of day, gust, frequency, and direction so you will be alerted when winds change using the iphone’s push alert technology. And.. it’s free. Search for windalert at the itunes app store.